The Jacuzzi was a cinematic trope once deployed as reliably as frantic Japanese tourists or a homeless man inadvertently witnessing the film’s entire plot. Playboys and villains toasted stiff-haired women in high-cut swimsuits, and good men climbed into the bubbles to be hoodwinked and lead astray. Mattel Inc. responded to the trend by manufacturing an unending stream of bathtubs, showers, and hot tubs for its Barbie Playsets range. There was Barbie Sweet Roses Beauty Bath, Barbie Living Pretty Beauty Bath, Barbie’s Bubbling Spa; endless variations on a single theme. In 1982 the National Broadcasting Association had cast-off its children’s ad guidelines and discontinued the limits on the number of commercials that could air. At last, advertisers were no longer prevented from hammering a sales message or the use of the words “only,” and “just” before the price. The next year N. W. Ayer took over the Mattel account. Barbie dolls reclined in a bubble bath or perched rigidly on the edge of a Jacuzzi in metallic bathing suits while the camera roamed over their plastic, foam-kissed legs. The salaciousness was in contrast to the girls in the playset commercials, who spoke in babyish tones as they manipulated their avatars. There was never any suggestion that Barbie would be joined in her bubbly spa or glass shower by a Ken doll, but Mattel Inc. skirted a fine line in a time when the Moral Majority was leading I Love America rallies. The playset campaigns managed to be simultaneously wildly inappropriate and chaste. The excessively wholesome behavior of the little girls served as a silent rebuke to viewers: How dare you see something else in this ad: it is you who is the sicko. A hapless dad pushed open the bedroom door while his daughter held out her hand. Thick bubbles protected Magic Curl Barbie’s modesty, a challenge crews would grapple with when shooting Barbie in the shower. The presentation of the accessories occurs at the denouement of the ads. The 1981 playset came with a bottle of bubbles, a fingernail-sized comb and hairbrush, a plastic chair, and a vanity. Barbie was dressed in a yellow ballgown for the father’s return. “Maybe you should stop being such a creep dad,” someone commented below the video. It was not for nothing that James Michener called the 1980s the Ugly Decade. An arch commentary on systems of power and the cinematic gaze, this commercial upended the traditional structure of a Jacuzzi scene, whereby the women existed as nameless, swimsuited wallpaper to a good ol’ boy carrying a cowboy hat and a magnum of champagne. Two girls glided the dolls towards the octagon-shaped playset–Barbie legs could move back and forth but no one ever bothered, not even on the commercials. The dolls slid into the water, alone together. The camera lingered on the bubbles coursing across their stiff legs. A girl flicked a plastic beach ball into the Jacuzzi, her eyes wild with excitement. Barbie’s creator understood that little girls didn’t want to pretend to be mommies. They wanted to be bigger girls. The benign, babyish play in the commercials belied that children did not always play gently with their Barbies. The dolls hunted each other down in the Dream Car and judo kicked their rivals over pink staircases. They turned the Dream House into a bordello, where they vied ruthlessly for the attentions of the lone Ken. 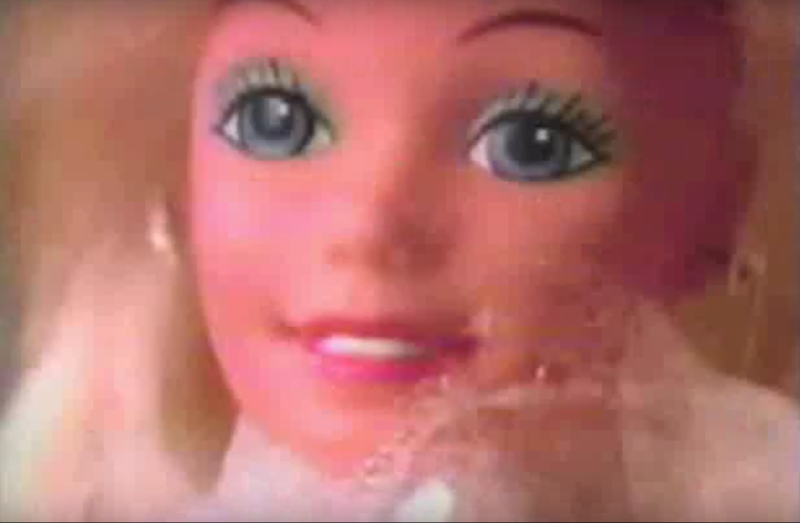 Briefly, a close-up of Barbie’s odd face filled the screen, her rictus grin and dilated pupils framed by bubbles. Large plastic diamond studs were jammed into holes in the side of the head. YouTube comments below the video point out that one of the child actors in the commercial is Fergie from the Black Eyed Peas, that the doll’s legs look huge, that water ruined the nylon hair and made the plastic stiff, that the girls in the commercial are giggling while they watch Barbie shower. Playsets embraced the era’s vulgar rococo Lifestyles of the Rich and Famous aesthetic. Bathtubs and spas became increasingly ornate as the eighties progressed. By mid-decade Barbie’s bath was perched on a platform, with a pink swan’s head faucet. The toys were manufactured in Taiwan until operations were moved to China in 1987. Mattel says a Barbie is sold every three seconds, which is 10.5 million dolls a year. These polyvinyl chloride, polypropylene, and ethylene-vinyl acetate ladies and their accouterments are with us still. The Bubbling Spa, and the Fountain Pool, and the Tropical Splash Barbie Pool ‘n Spa. Workin’ Out Barbie, Medieval Lady Barbie, and teen Barbie Midge, pregnant with a little plastic fetus called Nikki. Shedding particles of cadmium and lead, festering in landfills and travelling the world in the Great Pacific garbage patch, velveteen rabbits who never became real. N. W Ayers came up with the slogans “Be all that you can be” for the Unites States Army and “Diamonds are forever” for De Beers. Not even the adult who three decades later who would post a six-minute long video of a Barbie pretending to drink a glass of champagne, play with a rubber duck, and take selfies in a bubble bath. The video has been viewed over 1. 2 million times on YouTube.